This former brown rice eating and bread baking fanatic has changed her ways. Yep. It’s true. I’ve been experimenting with the Paleo diet and at the invitation of our daughters, completed my first Whole30 in January 2015. Initially it was too much meat for my husband and I, so we had to made some minor adjustments. (For background purposes, read more in detail of my early experience of Whole30 in the post Rich and Creamy Hot Chocolate and Weight Loss Wins). After a month of Whole30 and maintaining a general paleo diet, I had some weight loss but the biggest encouragement to continue came in getting the results of my annual physical. I was inspired back at the age of 18 to change my diet because of a family history of heart disease, cancer and diabetes. In spite of clean eating for many years since, annual blood tests showed escalating LDL levels. I would tell myself it was genetic and because the HDL number was unusually high I didn’t need to worry. However, it kept nagging at me that no matter what lifestyle changes I made in diet and exercise nothing seemed to reverse this trend. Every year LDL levels were a bit higher than the year before. I’ve read books that said all sugars and whole grain contribute to high cholesterol but not everything in print plays out in real life. Especially when it comes to diet. Everyone is so different. But when our daughters approached me about doing the Whole30 with them I thought this was an opportunity to see if it would reverse this upward trend in overall cholesterol. I had been slowly decreasing gluten and grain but this was all out cold turkey. So, are you ready for this? After more than 90 days of eating saturated fats in eggs, grass-fed red meats, some pork, wild caught seafood, coconut oil and full fat coconut milk, lots and lots of veggies, some fruit, but no sugar, no dairy or processed foods, my LDL numbers decreased 31 points from last years blood tests and my already high HDL went up and triglycerides which were already low, went down. My over all cholesterol lowered by 26 points. I was so surprised and pleased that a simple medical test had confirmed my lifestyle choices. 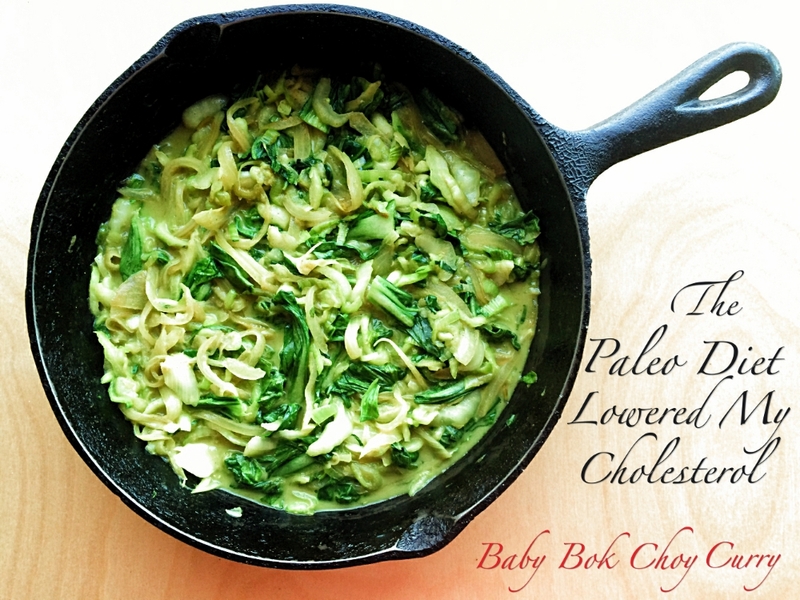 The paleo diet had lowered my cholesterol. In the process of searching for some great Paleo/Whole30 recipes, its noticeable that people interpret the diet differently. Some lean heavy on meat consumption while others consume more veggies. 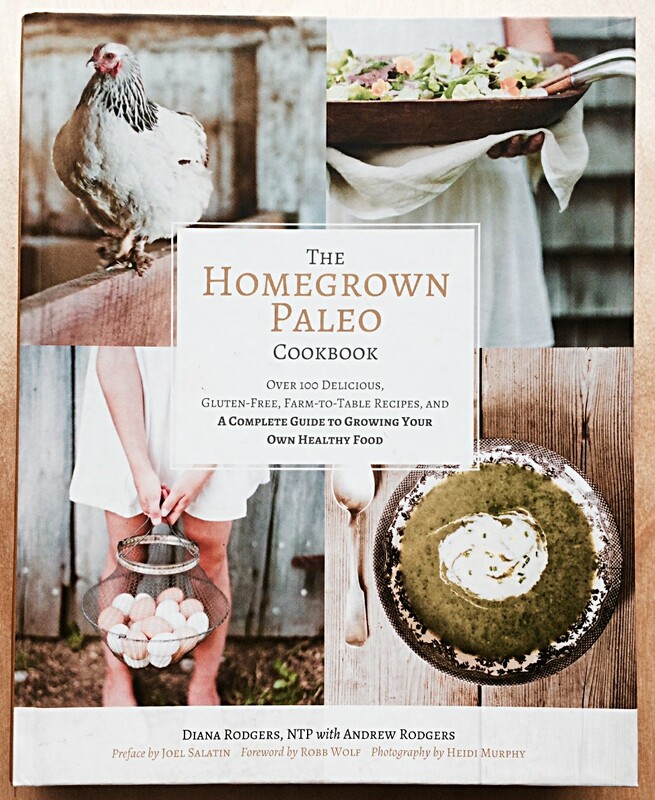 Along the way I happened across The Homegrown Paleo Cookbook by Diana Rogers. Here’s a woman who grows and raises much of their own food and incorporates a lot of fresh vegetables into her family’s daily regime. The book is full of instructions on sustainable living. And her recipes look beautiful. I can’t wait to make more of them. I liked her right off. After all, she loves veggies – what’s not to like? This recipe is from her cookbook. 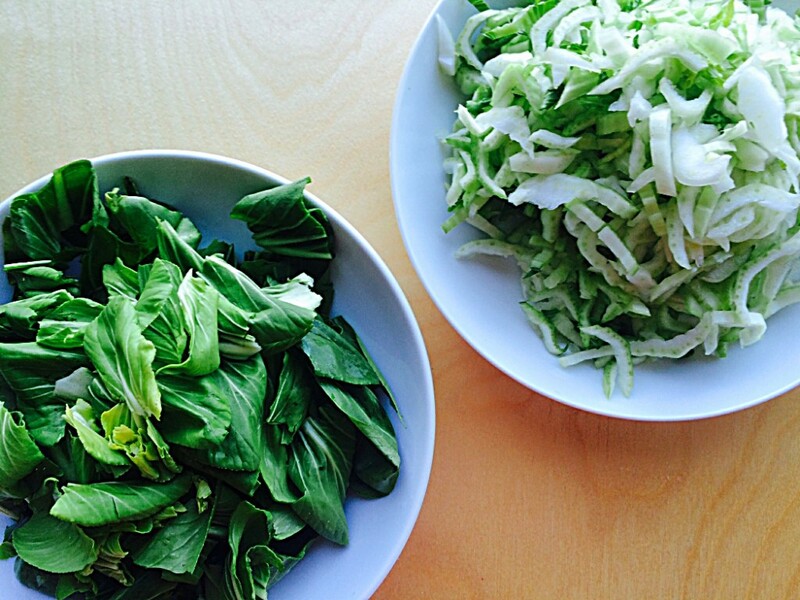 We grow an abundance of Asian greens in our garden so this Baby Bok Choy Curry will be a regular at our summer meals. Enjoy it with grilled protein of any sort for a simple meal. It’s another awesome way to get your nutrient dense leafy greens. 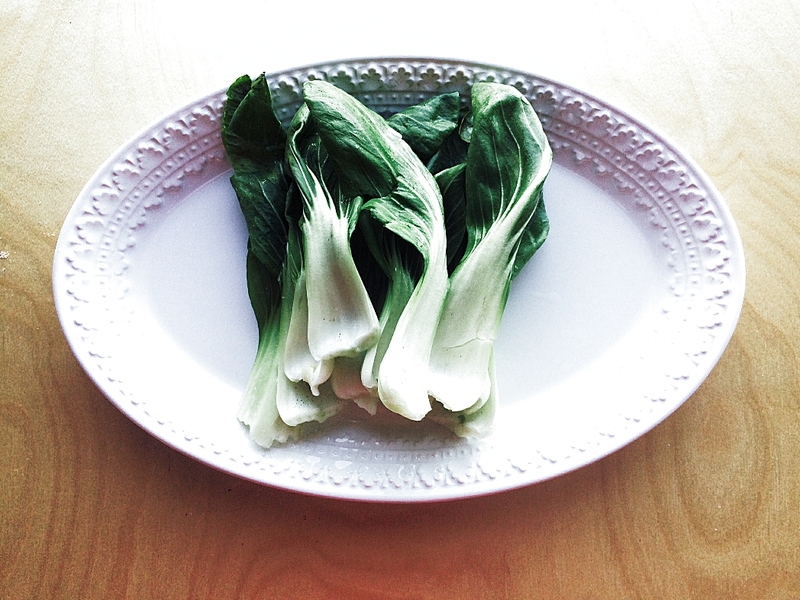 A note on buying Baby Bok Choy…it is more reasonably priced at your local Asian Market. I priced it at the local natural foods store at $3.19 a pound, in contrast to the Asian Market @ .99 cents a pound. Quite a difference, right? Thanks for letting me share this encouraging news. I will keep you posted as to further changes. Please let me know how you like this recipe! 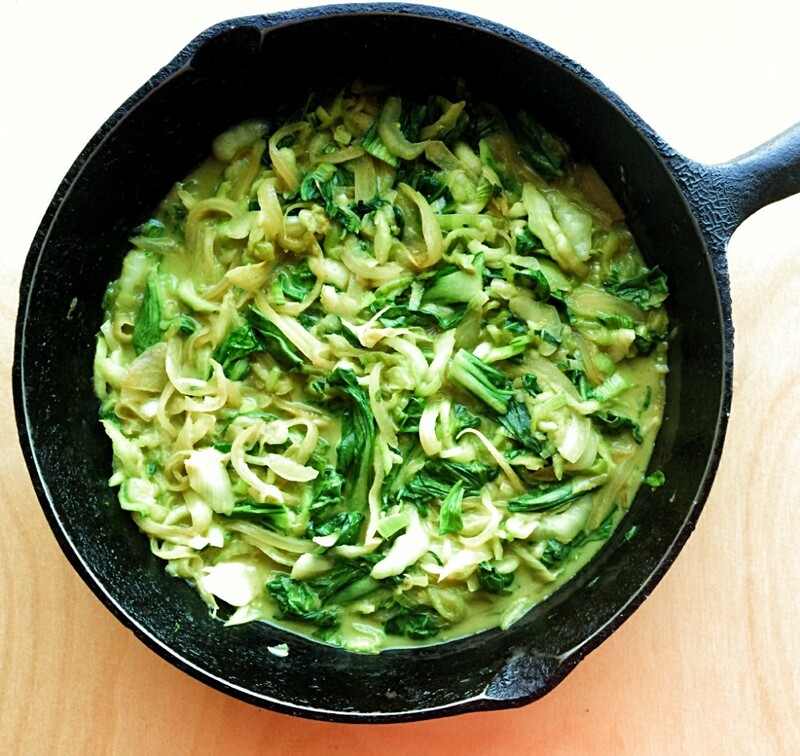 In a large skillet over medium – high heat, warm the coconut oil. Add the onion and cook for 3 minutes, or until the onion begins to soften. Stir in the curry powder and cook for another few minutes, until well incorporated. Add the bok choy stems and saute for 3 minutes. Add the leaves and cook until wilted, about 5 minutes. Add the fish sauce, coconut aminos, and coconut milk. Cook for just a few more minutes, then garnish with cilantro and serve.